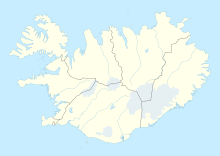 Mývatn Airport (IATA: MVA, ICAO: BIRL) is an airport serving Reykjahlíð, Iceland. The Lake Mývatn area is a nature preserve of volcanic origin. ^ Airport information for MVA at Great Circle Mapper. This page was last edited on 31 October 2017, at 11:41 (UTC).